Your older dog no longer finds enjoyment in the walks he used to love. He doesn’t even want to leave the house anymore, let alone run around. It seems like he’s lost all interest in playtime activities, offering a mere sniff at the toys that once brought so much enjoyment before turning his head. It seems like all he wants to do is lie around on your couch all day long, barely even moving to eat or drink. Your once cherished fur-kid struggles even to stand, a deep look of intense concentration and effort clouding his once carefree features. You feel terrible for him, but it seems there just isn’t anything you can do. Your pet has a severe and debilitating case of arthritis. What are you going to do? 2. What is an Orthopedic Dog Bed? 4. Dog Arthritis: What is it? Countless dog beds exist on the market, ranging from a bit of pillows to expensive memory foam to simple cotton cushioning, all meant to provide some degree of comfort to pets any age. They has a special, unique design, meant to help relieve pain in elderly or injured dogs. Some of the best are stuffed with memory foam to help relieve pressure points and provide extra support for deteriorating bones & joints. As of now, there is no exact legal or technical definition for ‘Orthopedic’ when it comes to dog beds; owners must simply use their best judgment. Most simple definitions claim an orthopedic mattress is “designed to support the joints, back, and overall body”. If you squeeze a dog bed and are able to flatten it, feeling your fingers or the floor, the bed isn’t offering enough support and probably doesn’t qualify as an orthopedic dog bed. Ask yourself if the dog bed you are considering for your own pet fits the description, or falls in the category, above. Does it help correct joint problems or skeletal injuries, or at least provide adequate support? There are countless dog beds out there, but it takes special requirements. You can’t just offer any old blanket that flattens against the ground, or small pillows that roll away. Below are listed a few important factors to consider when investing in your dog’s first bed. Is money back/durability guarantee included? Cost is certainly a factor. The higher quality the bed, the higher the price – usually. Sometimes orthopedic dog beds are simply priced high due to the brand name, and may not be actually better than the ‘other model’. Dog Arthritis: What is it? Your dog’s in pain. He will no longer jump in the car and shies away from company, as opposed to the enthusiastic embrace that once was. He trembles every time he tries to stand, a tearful look of pain covering his features. He has no taste for even the shortest walk, an experience that used to bring you both great joy and comfort. Arthritis can be defined as painful, uncomfortable stiffness in the joints, and occurs naturally to both humans and will occur in most dogs as they age. Most commonly, Osteoarthritis, is a degenerative disorder that happens when that viscous synovial fluid, the one thing that used to provide cushion between bones in a joint, begins to wear away. The bones literally begin to rub together. Ouch! In these situations, an orthopedic bed would more than come in handy, offering the comfort your dog needs to live out his golden years in peace and harmony! They are also great for Hip Dysplasia, a degenerative yet hereditary disorder common among many larger breeds, in which the femur doesn’t fit well into the pelvic socket. This makes for a painful, uncomfortable walking/weight bearing experience! Though this can be treated, and even often corrected, with surgery, most owners don’t have the capabilities to dispense the money required to pay for such an endeavor. Although Hip Dysplasia is a potential danger for any dog, it’s common in larger breeds – especially those that tend to grow faster. Today, memory foam is considered a valuable material when it comes to support and comfort. Though these dog mats might not look like the traditional bet in a human sense, they fulfill every requirement a dog bed should very well! These mats are designed with two layers of 2 inch thick closed cell memory foam wrapped in a durable candora cover. They are machine washable, and can even be used for the back seat of your car! Again, these thicker, stylish and attractive dog beds are made with special, durable memory foam that won’t flatten or pancake over time. Handmade in the USA by Californian craftsman, these are easy to clean and machine washable with a 100% microfiber cover. On top of all this, you get a 10 year guarantee! 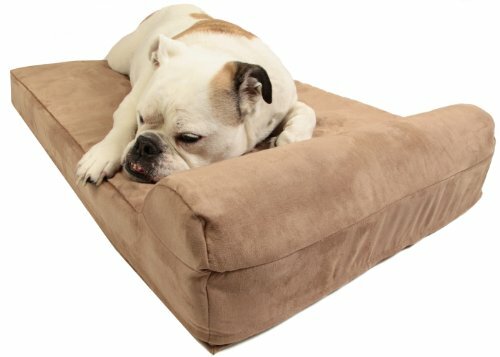 Specially designed for extreme comfort, these beds utilize superior construction techniques, providing premium, upholstery-grade microfiber siding along with only the most comfortable ‘plush and lofty faux fur’ sleeping surface that absolutely any dog will lavish in. The 5 inch thick multilayer orthopedic mattress consists of a 1.5 inch layer of memory foam on top of a 3.5 inch layer of dense support foam. Not only is this a pretty large bed, large enough for any but the biggest giant breeds, it comes with a 10 year guarantee not to flatten. The foam is guaranteed to retain 90% of its shape, or your money back. With a 100% microfiber cover, it’s easy to clean and machine washable to boot. If you do own a giant breed, this bed comes available in giant sizes as well! 1. What is the difference between a normal dog bed and an orthopedic? A normal dog bed can be defined as anything that qualifies as a bed, from simple pillows to a mattress to a few blankets. An orthopedic is specially designed to provide adequate cushion to a dog’s joints. 2. What causes arthritis in dogs? There are about 100 different forms of arthritis, but the most common by far in both humans and dogs is known as Osteoarthritis. Osteoarthritis occurs when the cartilage, providing cushion between joints and preventing bones from touching each other, begins to wear away. This can be a simple result of age, caused by injury, or a result of poor health. As this cushion begins to erode, the actual bones themselves start to rub together. 3. When/why will my dog get arthritis? Most dogs get arthritis when they are older, as a result of normal cellular aging. To be specific, mitosis (cellular copying) slows down as our dogs age. Old or dying tissues don’t repair themselves as quickly as they once did. Arthritis can also be caused by injury to that particular joint. 4. How do I know if my dog will develop arthritis? If your dog lives to the end of the lifespan for his particular breed, he’ll probably develop some form of arthritis. This is a simple fact of life. All you can do is help him stay as healthy as possible, and limit the chances this condition will arise. ➔ Offer a High Quality nutritional diet. ➔ Ensure your pet maintains the recommended weight for that breed. ➔ Consult a veterinarian regularly regarding your pet’s health. ➔ Ensure your pet is able to get plenty of exercise. 5. What else can I do to make my dog comfortable? Believe it or not, a recent study indicates around 54% of all domestic pet dogs are considered overweight or obese. This amounts to several Million. Obesity is an Enormous problem among pets, and a huge leading factor contributing to health problems. Most dogs are going to develop arthritis as they age; it is a fact of life. Just like most humans develop joint issues in their golden years. However, that same dog is going to develop joint issues at an earlier age if he has to carry around an extra 10, 20 or 30 pounds every day of his life. On top of that, it is going to be that much more painful for your pet when he does. Make sure your dog gets enough daily exercise, and be sure to offer a high quality diet. A dog bed complete with bolster also comes in handy! 6. What else can I provide my aging dog to help his/her joints? There are many joint support supplements available out on the market today, both for humans and pets. A high quality diet with the best nutrition you can provide always helps. You might also consider dog ramps for your car, couch, or any raised surface. Non slip dog booties/socks are always a good idea. You might also cover slick, tile surfaces with carpets for extra traction. 7. How long should a dog bed last? Most dog beds on the market today come with a 10 year ‘no flatten’ guarantee. Of course this is meant to be considered within reason; excess weight piled on top of these dog beds probably won’t hold up. If they are designed for small breeds, make sure a small breed is using them, and vice versa for large breed dogs. 8. What is the most common material used in orthopedic dog beds today? Most orthopedic beds tend to use memory foam, at least in part, in a large portion of their products. Memory foam is a polyurethane material sensitive to pressure and temperature, often used in mattresses, where it molds to a person’s body shape. Make sure you accommodate for your aging dog. Just like the two month old pup of years ago, he/she needs your care and understanding. 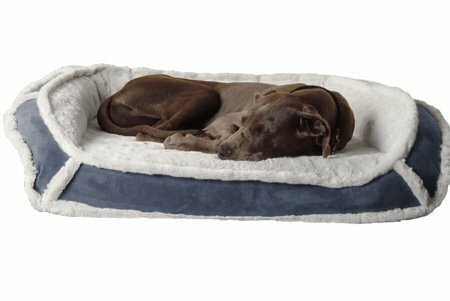 Be generous and offer one of these fantastic orthopedic dog beds; the same thing will happen to you one day!